If there was one celebrity I would have loved to meet, it would have been Charlie Chaplin. The man and his little tramp character are not only still recognized internationally, but Chaplin acted, wrote, directed, produced, and composed the music for a range of films (many his own) that are now regarded as the classics of early cinema. He was an independent man who wanted to do it himself, and on a path that took him from poverty to international success he acquired the means to do just that. I have nothing but respect for Chaplin's accomplishments and am amazed at how a single man was able to so dramatically change the landscape of a burgeoning entertainment industry. It's incredible that Modern Times is now over 70 years old, and even more incredible that it's still capable of garnering laugh-out-loud reactions. True, slapstick is slapstick, but what made Chaplin such a force is how he merged social concerns, in this case unemployment and the mechanization of the workplace, into elaborate gags. You may recall the famous scene where Chaplin slides between a series of giant gears after failing to keep up with a conveyor belt that was going too fast. Or, a scene where a small flag falls off the back of a truck, and after picking it up Chaplin finds himself leading a group of striking workers. The basic setups are simple, but there's always something endearing and honest about watching Chaplin's struggling little Tramp - the character he's most remembered for. So much could be suggested by showing the light and dark sides of a man who was down on his luck, or often just in the wrong place at the wrong time. Films like Modern Times established a connection and understanding with those real folks who at the time of this films release were smack-dab in the middle of the Great Depression. I couldn't say it better than Nick Davis does in an excerpt from his review, noting, "[Modern Times] finds the comedy in the dashing of hopes, though it has both the verve to be funny for funny’s sake when it feels the urge, and the fortitude not to tidy up or erase every dark stroke in the picture. Orphans are not un-orphaned, and some of them permanently vanish. Lovers on the lam stay on the lam. The sidewalks and roads all feel dusty, as well they might in 1936. 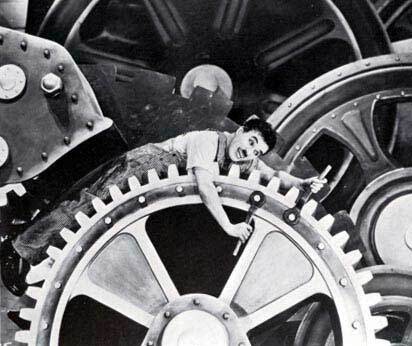 Though this is hardly The Bicycle Thief, Chaplin shows real conviction in evoking the dehumanizing routine of the assembly line, the political roils of factory strikes and Communist agitation, and the chintzy desperation of Depression-era have-nots". When you consider how heavy some of these issues must have been in the mid-30s it seems incredible that Chaplin constructed such a successful comedy. Constructed seems to be the right word too because the structure of the film is clearly unbalanced; motivated by a series of smaller skits strung together in lieu of a classic plot arch. Yet, the film works because of the moral clarity of the Tramp. It's not just the story of a funny little man, it's quite honestly the story of 'modern times' and the hardship that can accompany them. This tale of frustration took courage to tell, especially when the subject matter came from a man who had become wealthy playing a hobo. But, perhaps it took a man who had seen both sides of the coin to really understand the weight and levity of what was going on. 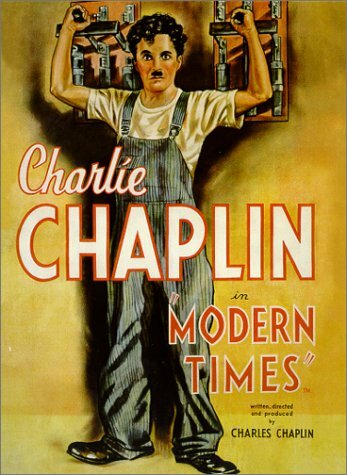 In my opinion, Modern Times was Chaplin's most pitch perfect film. And despite all the seriousness, at the end of the day Modern Times is a comedy that sticks with me. Chaplin and the feeding machine may in fact be one of the funniest moments in movie history, and I was literally in tears the first time I saw it. All the ingredients are clearly there - this is a comedy that will never go out of style.